It is with deepest sadness that we announce that Phil Redmond, part of our Tenor 2 section and the choir’s Event Secretary passed away at Christmas. 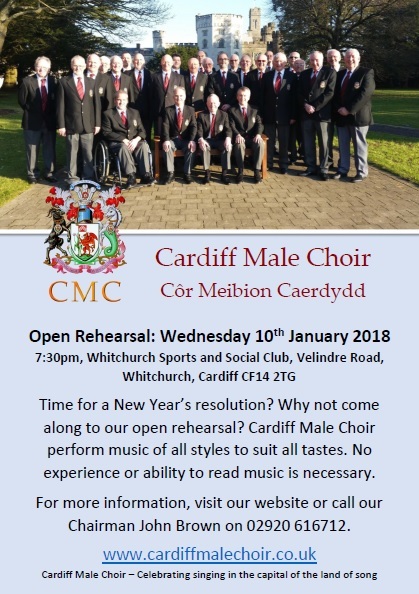 It was a huge shock to all of us here at Cardiff Male Choir. Phil was a wonderful member of our choir, loved and well respected by all of us. His enthusiasm for the choir knew no bounds and he drove the choir forward immensely as our Events Secretary. Phil will be hugely missed and the choir wish to send their sympathies and best wishes to Marilyn, Phil’s wife, and all of their family. Phil’s funeral will be held at Glenwood Church, Circle Way West, Llanedeyrn, Cardiff CF23 6UW on Saturday the 13th of January at 10:15am.